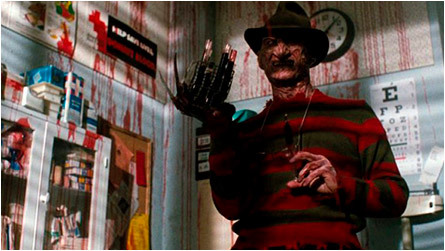 In A Nightmare on Elm Street 4: Dream Master (1988), several survivors of supernatural killer Freddy Krueger’s last death rodeo got out of Westin Hills Hospital and are attending high school like normal teens with severe social issues. Kristen, one of the made-it-out-alive’rs, is starting to have bad dreams again, starring the Frank Sinatra of Slash. 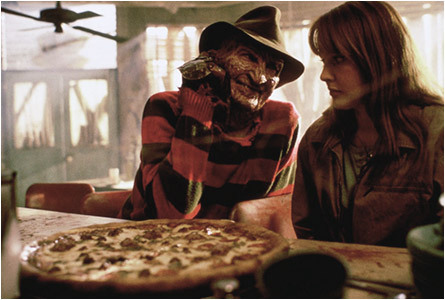 Freddy’s back to sever ties with his former friends, and pops up after a dog pees on his buried bones. There’s a joke in there somewhere. 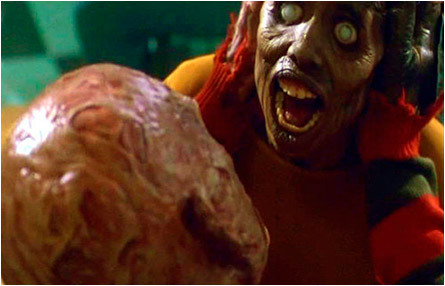 Sir Krueger later makes the rounds via a naked chick inside a possessed waterbed (you’d think that’d be dumb, but it actually isn’t) and a Roach Motel™ (one of the funnier sequences). Kristen is the last child of Elm Street — and Freddy, gorging on gleeful killings, needs her to find more kids for him to kill. Hey, a job is a job in this economy. Kristen invokes her New Age friend Alice by screaming (yeah, made sense to me, too), and now Alice, using the previously invoked Dream Master spell, takes Freddy down (yeah, made sense to me, too). Turns out Alice is the Guardian of Good Dreams (gimme a break) and is the ONLY ONE who can release the tortured souls of Freddy’s victims. Either I got lost in the middle of this mess, or the movie writers did. At least Freddy was fun to watch dispatch teenagers. It’s always nice to see someone enjoy what they do for a living. 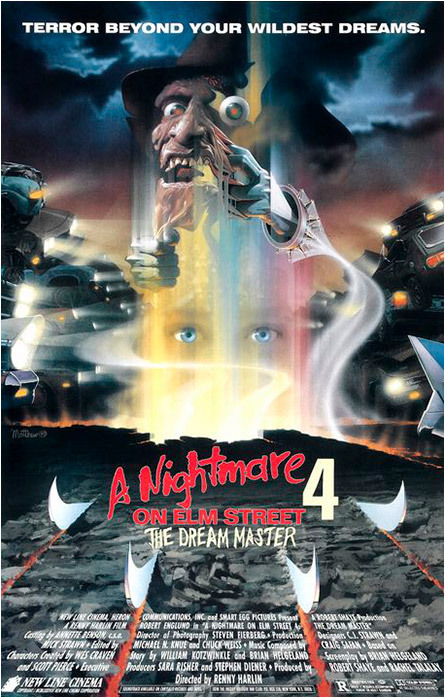 This entry was posted on August 20, 2018 at 4:46 pm and is filed under Classic Horror, Evil, Slashers, TV Vixens with tags A Nightmare on Elm Street 4: Dream Master, Classic Horror, Dream Master, Evil, Frank Sinatra, Freddy Krueger, New Age, possessed, Roach Motel, Slashers, Supernatural, TV Vixens, Westin Hills Hospital. You can follow any responses to this entry through the RSS 2.0 feed. You can skip to the end and leave a response. Pinging is currently not allowed.